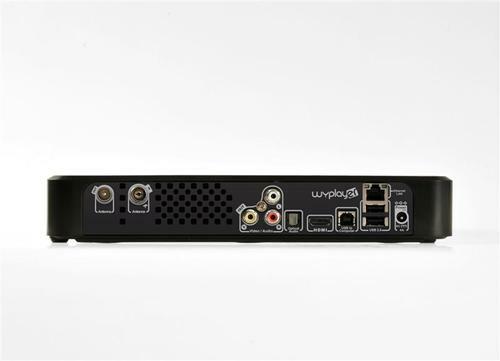 It doesn’t take a satellite dish or subscription service to get yourself a PVR these days and a company from France is pushing the set-top box paradigm a little further as of last week with an HD multimedia HDD device known as the Wyplayer. It’s a good-looking, fairly compact device in the flesh with all the ports you’d expect in the shape of 3 x USB, Ethernet, RCA and, of course, HDMI (1.2 only). It also happens to have a built-in Wi-Fi N receiver with no ridiculous aerial sticking out of the back. So, already we’re looking at one function most PVRs don’t have – media streaming straight from your computer. Naturally, it plays back just about every file format under the sun including (are you ready?) MOV, MKV, H.264, VC1, ISO, AVI, ASF, MP3, AAC, WMA, OGG, WAV, AC3 and soon the lossless FLAC. Not bad at all. Plus, because the Wyplayer is internet connected there’s worlds of streamed web radio, podcasts and, soon likely, connection to services like Spotify too. It’s also happy to run Flash so you can watch YouTube and iPlayer in High Quality on your big screen. There’s services accessible through the Wyplayer online portal which you can set up on your computer so that you can read your RSS feeds and access P2P services too, as well as all sorts of other features. Not quite sure how much P2P access you get, though. The machine is capable of doing all sorts of things like actually recording Flash streams too but it’s been disabled so as not to start a fight with YouTube and the Beeb. Doubtless the Wyplayer can be chipped and the limits bypassed in some way, so it might be a good device for those confident with a little code and touch of solder. Back on the legal side, the Wyplayer has twin tuners, so you can record and watch something different at the same time, plus it offers three hours of pause time and a really very nice, friendly and usable EPG and menu. It also happens to have a decent remote too. The 500GB version will cost you €395 including postage and packaging but it also comes in 160GB, 320GB, 1TB and 1.5TB sizes. Sadly, the site’s only in French at the mo but I assure you they will deliver in the UK – so long as you can work out the store. Good luck.